Why is it important to wear a seat belt when I travel during pregnancy? How should I wear a seat belt while I am pregnant? What should I know about air bags when I travel in a car? Are there laws regarding child safety seats while riding in a car? If I am pregnant, when should I buy a car seat for my baby? Where should child car seats be installed in the car? What types of car seats are available for infants, toddlers, and school-aged children? What should I keep in mind when choosing a car seat? What should I know if I am considering buying a used car seat? What do I need to do after I buy a car seat? Although the baby is protected inside your body, you should wear a lap and shoulder belt every time you travel while you are pregnant for the best protection – even in the final weeks of pregnancy. You and your baby are much more likely to survive a car crash if you are buckled in. Buckle the lap belt below your belly so that it fits snugly across your hips and pelvic bone. Place the shoulder belt across your chest (between your breasts) and over the mid-portion of your collarbone (away from your neck). Pull any slack (looseness) out of the belt. Keep 10 inches between the steering wheel and your breastbone. As your belly grows, you may not be able to keep as much space between you and the steering wheel. If the car has a tilt steering wheel, make sure it is angled toward your breastbone, not your belly or head. 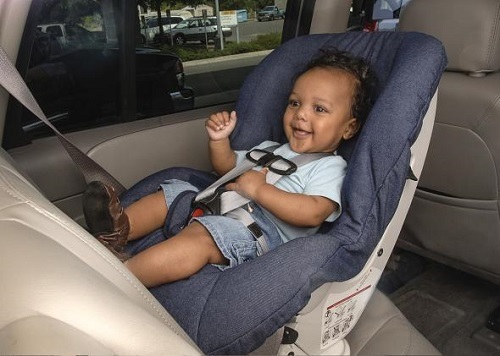 All 50 states have laws requiring the use of child safety seats for infants and children at different ages. In 48 states, there are laws requiring the use of booster seats for children who have outgrown their safety seats. Go to http://www.ghsa.org/ html/stateinfo/laws/childsafety_laws.html to find out the laws for your state. In most states, you can be stopped for a child seat violation as the only reason. You cannot take your newborn home from the hospital without a car seat. Plan to have the car seat at least 3 weeks before your due date so you will have time to install it correctly and learn how to buckle the baby in safely. All car seats for children should be used in the back seat of the car—never in the front seat. Airbags in the front seat can cause serious injury to children. Until they reach age 13 years, children should always ride in the back seat. 1. 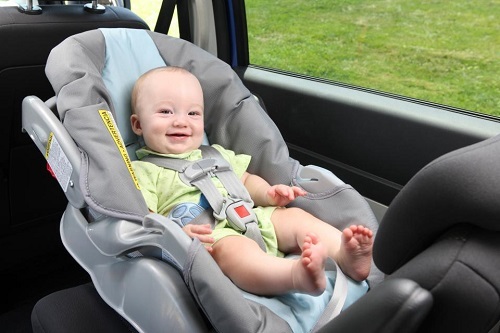 Rear-facing car seat – In a rear-facing car seat, the baby is turned to face the back windshield of the car. Infants and toddlers should ride in a rear-facing car seat until they are 2 years of age or until they reach the highest weight and height allowed by their car seat’s maker. 2. Forward-facing car seat – A forward-facing car seat faces the front windshield of the car. Toddlers and preschoolers who have outgrown the height and weight limit of the rear-facing seat should use a forward-facing seat. 3. Booster seat – A booster seat raises and positions your child so that the vehicle’s lap and shoulder belts fit properly. Your child should use a booster seat until the car seat belts fit properly. This usually occurs when the child is between the ages of 8 years and 12 years and is at least 4 feet 9 inches in height. Know whether your car has the LATCH system. LATCH stands for Lower Anchors and Tethers for Children. Instead of seat belts, special anchors hold the seat in place. If your car and car seat do not have the LATCH system, you will need to use seat belts to install the car seat. Try locking and unlocking the buckle while you are in the store. Try changing the lengths of the straps. Read the labels to find out the seat’s height and weight limits. The National Highway Traffic Safety Administration offers parents a five-star rating system on its website (http://www.nhtsa. gov/Safety/Ease-of-Use) based on how easy certain car seats are to use. Do not buy a used car seat if you know it has been in a car crash. Also, used car seats may be missing parts or instructions. Avoid a used car seat that looks old or worn or is missing labels with the model number and maker’s name. Keep in mind that car seats have expiration dates. You can check the expiration date for any car seat on the maker’s website. After you buy the seat, register it with the maker using the card that comes with the seat, or register it online with the National Highway Traffic Safety Administration at http://www-odi.nhtsa.dot.gov/recalls/register/childseat/index.cfm. Registering your car seat allows you to get updates and recall notices. You can take your car and the seat to a car seat inspection station. These stations can check whether your car seat is installed correctly after you have installed it yourself. FAQ018: Designed as an aid to patients, this document sets forth current information and opinions related to women’s health. The information does not dictate an exclusive course of treatment or procedure to be followed and should not be construed as excluding other acceptable methods of practice. Variations, taking into account the needs of the individual patient, resources, and limitations unique to the institution or type of practice, may be appropriate.